Anthony Leon Brundage and Richard Alfred Cosgrove. British Historians and National Identity, From Hume to Churchill. London: Pickering and Chatto, 2014. 272 pp. £60.00 (hard back), ISBN 978-1-84893-539-6; £24 (eBook). In the last two decades, historical studies focussing on themes of memory creation, mythmaking and national identity have burgeoned. 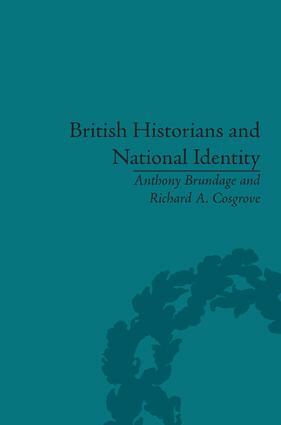 Authors Anthony Brundage and Richard A. Cosgrove, in their 2014 book British Historians and National Identity, attempt to link a series of single-authored multi-volume histories to the creation of particular themes within British identity. The central thesis of the work is that British national identity was never, and is not today, a static concept: “Central to the manner that English people think of themselves was (and is) their history: real, imagined or invented; all categories of identity are rooted in some century or era of the English story”. By focussing upon British history specifically, Brundage and Cosgrove have been able to narrow the scope of their ambitious work to the development of an historical framework in which historians themselves advanced and influenced the exceptional island story. This particular study is unique in that it links the work of a series of historians, from David Hume to Sir Winston Churchill, with the goal of demonstrating how “history (and historians) provide the collective memory for the nation.”  Fascination with the idea of identity construction, particular within a British, or more often, specifically English framework, has previously been taken up by a number of scholars. Linda Colley’s Britons: Forging the Nation (2009) represents particularly well the extent to which British identity was constructed around or indeed, against the idea of an enemy ‘other’: namely, the French. Likewise, as is evident with Anglo-French scholar Robert Tombs’ recent publication The English and Their History (2015), this is a topic that continues to draw intellectual scrutiny. Engagement with memory creation and identity within the context of war and conflict remain popular areas of research, with Samuel Hynes and Mark Connelly, in the last decade or so, analysing the process of selection through which shared memory and personal narratives become collective. Jonathan Rose’s The Literary Churchill (2014) and David Reynolds’ In Command of History: Churchill Fighting and Writing the Second World War (2004) in turn take a specialised and extremely personal approach in working to shed light upon how one political actor and historian understood and interpreted their own achievements. The authors emphasise the extent to which powerful themes and symbolic events such as 1688, early constitutional rights, and the idea of the protestant nation were taken up and confirmed, or in some cases challenged, by historians. In doing so, the authors incorporate both descriptive and analytical elements of each historian’s work, and identify important contextual features, which influenced the writing style and ideas of the period. The analysis of Thomas Babington Macaulay’s extremely popular 19th century writing, which made English history synonymous with progress, for example, successfully illustrates how his popularity as an author in Victorian England, coupled with his rather traditional beliefs that extolled the 1688 Glorious Revolution as a source in the narrative of national greatness, “positioned him to influence the national narrative.”  However, the discussion surrounding J. A. Froude’s also popular 12-volume History of England from the Fall of Wolsey to the Defeat of the Spanish Armada, as centred upon the origins of empire remains weaker than other chapters, given the largely descriptive nature of the text. The assertion that Froude’s decision to end his history in 1588 “shows that the stirrings of a mighty empire were of equal value to him as the rise of Protestantism,” remains unconvincing given the balance of the section. While this point may not be mistaken, the bulk of the chapter is focussed upon biographical material and Froude’s writings on religion. While the overarching argument of the book makes sense intuitively, at least as part of a broader context, it runs into difficulties when attempting to build up a solid explanatory framework around these individuals. The focus upon historians as a source of identity creation inevitably excludes other potential sources of explanatory value such as popular culture and mass media products, and results is some problematic assertions. For example, in the analysis of Churchill, the authors assert that the popularity of social history in the post war years provided “a sorely needed positive view of English exceptionalism for a war-weary populace.”  Collective memory and identity creation cannot be distilled into such a straightforward narrative of supply and demand. The fact that historians like John Lingard, for instance, have attempted to challenge the place of the Reformation in the national narrative and create a rival – Catholic history – failed to revise “the national narrative in any fundamental way,” leaves questions surrounding the ability of historians to affect any idea of collective identity save those that were already deeply ingrained. The writing of popular authors such as Macaulay and Froude may have confirmed a narrative that was already in existence, but this leaves little room to understand or explain how such narratives are constructed and, indeed, how they change. How history is written and remembered is certainly far from a straightforward endeavour. In the final analysis, the importance of national identity and its construction, confirmation, and even change over time, cannot be overstated. With this in mind, Brundage and Cosgrove have drawn attention to the ways in which prestige, audience focus, experience and personal beliefs all played a critical role in how British historians – from David Hume in the 18th Century to Winston Churchill in the 20th – have approached and written their national histories.